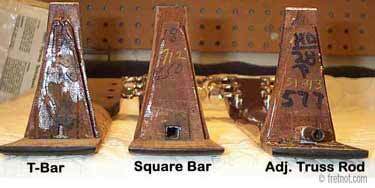 The majority of instruments made today have single action truss rods. This means the rod has the ability, when tightened, to place pressure on the back of the neck and cause the neck to bow backward. This allows us to counteract the tension of the strings and straighten the neck. Dual action, or two way, truss rods can create tension in both directions. The important distinction here is a dual action truss rod can create relief by itself, something that is usually done by string tension. Though not particularly common, some necks can be so stiff that the neck remains too flat or slightly back bowed even under string tension. A dual action truss rod permits us to "create" relief by bowing the neck forward. Truss rods that tighten in both directions will have their truss rod nut welded to the rod. Double truss rods are commonly found on 12 string guitars and some basses as they provide additional strength and rigidity. They are two individual truss rods laid side by side in the neck. To strengthen the neck and resist bowing, necks are usually inlaid with something, be it a steel rod, graphite bar or hardwood. Here we see a comparison of Martin's truss rods. The T-bar and Square bar are not adjustable but serve to strengthen the neck. The third rod is an adjustable rod with nut.